Teacher loves trying new recipes and has several online sources for new recipes. 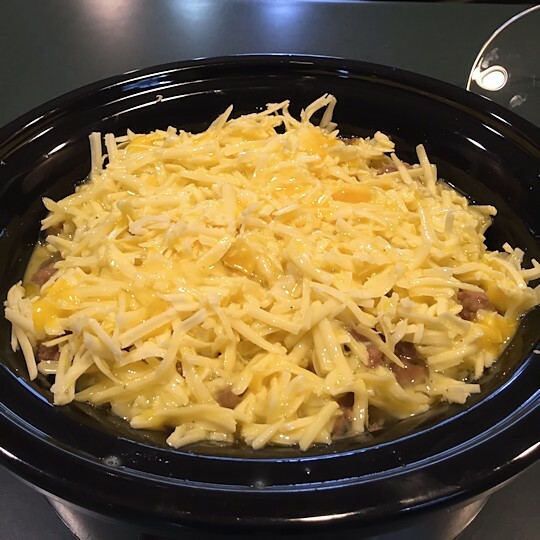 One of his favorites is Iowa Girl Eats, which is where he found this Crock Pot Casserole Recipe. 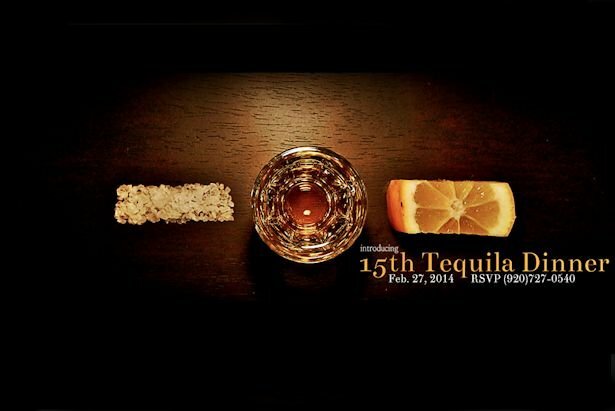 Of course, we put our own spin on it. We made it for Christmas Day brunch and it was a huge hit with everyone, even Little Guy who HATES to try new recipes. Now THAT’S a recommendation! It’s also become a favorite go-to recipe when we need a quick supper, which is pretty often in our busy family. 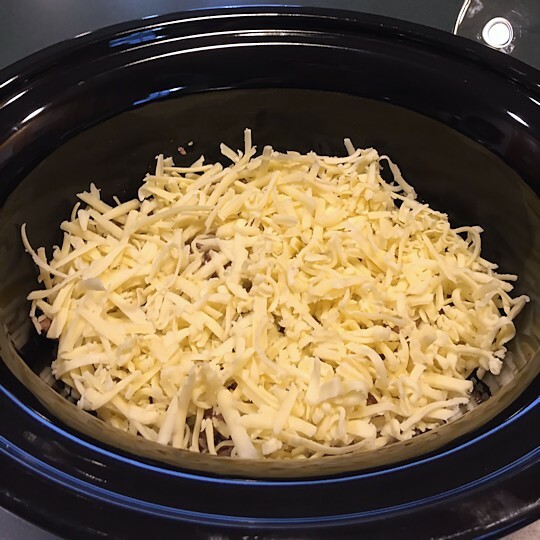 The best part about this crock pot casserole recipe besides how incredibly yummy it is is that unlike some crock pot recipes that call for a lot of prep, this one is mostly dump-and-pour. In fact, it’s so easy I’ll bet your kids could do most of it by themselves! Maybe for a Mother’s Day breakfast in bed… Hint-hint kids! 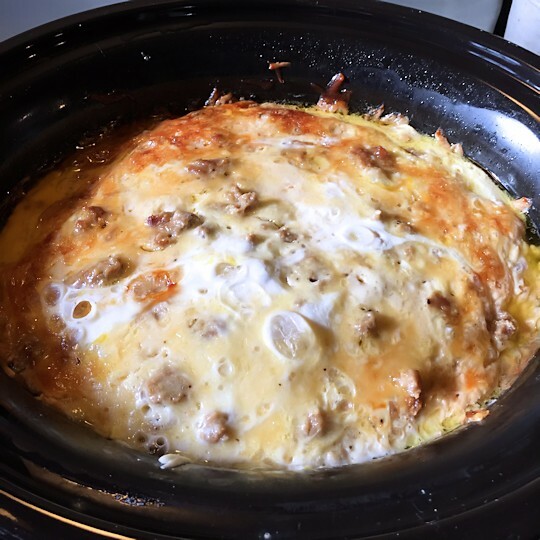 The basic ingredients are shredded hash browns, breakfast sausage, cheese, eggs, and milk. Which I forgot to include in the photo. Oops! 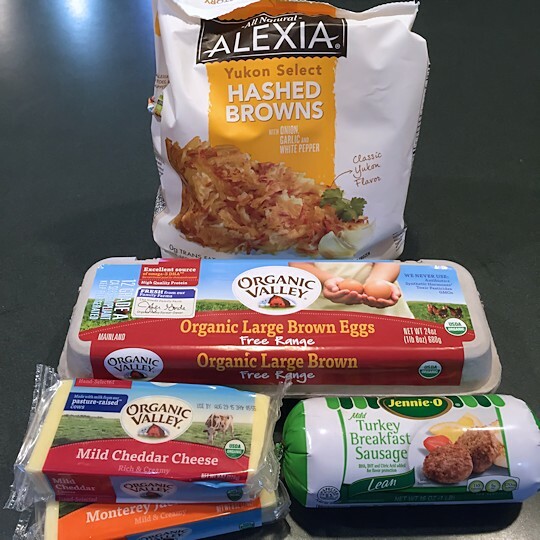 We put our own healthy twist on things with organic cheese, organic skim milk free range eggs, turkey sausage, and all-natural hash browns that have “potatoes” as the only ingredient. The switch to turkey sausage and skim milk saves 40 calories per serving! Brown the breakfast sausage. This is the only step you may want to help your kids with; the rest they can probably do on their own. 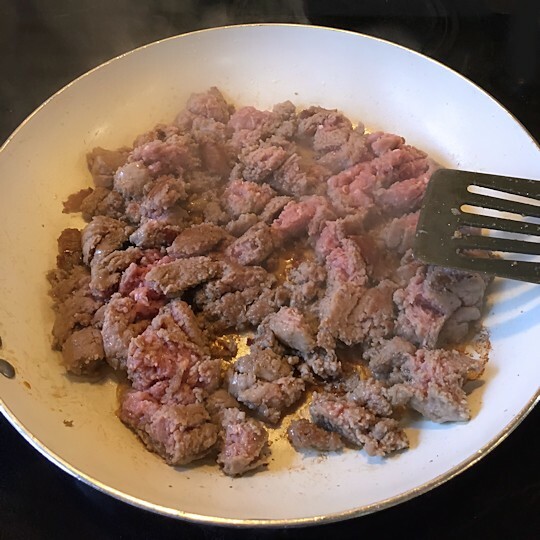 We haven’t tried any other meat yet, but I’ll bet it would be great with bacon, Canadian bacon, sliced breakfast sausage links, pretty much anything you like with your eggs. 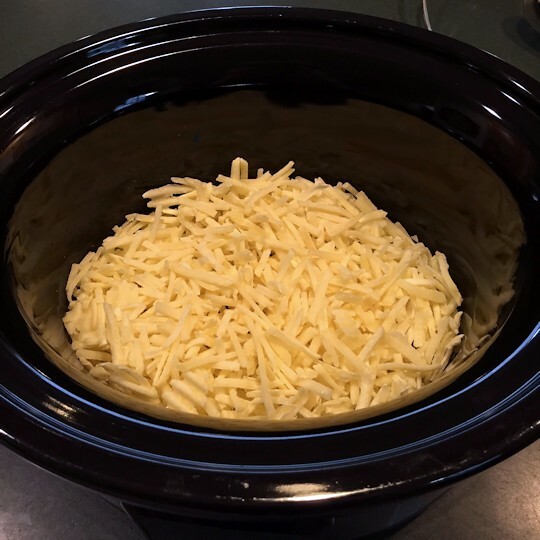 This time I used mild cheddar and Monterey Jack, but we’ve also used sharp cheddar and mozzarella, and sharp and mild cheddar. So far we haven’t found a cheese combo that we didn’t like. 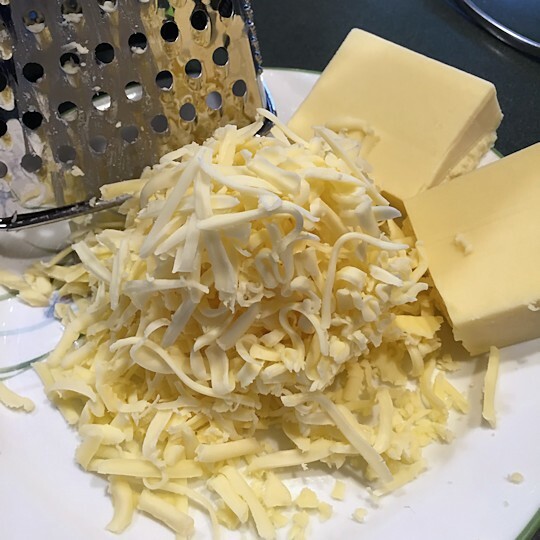 Next time I make it I’m going to try using less cheese next time to help cut down on fat – shhh, don’t tell my family! I’ll let you know if my family notices, and if it’s as good. 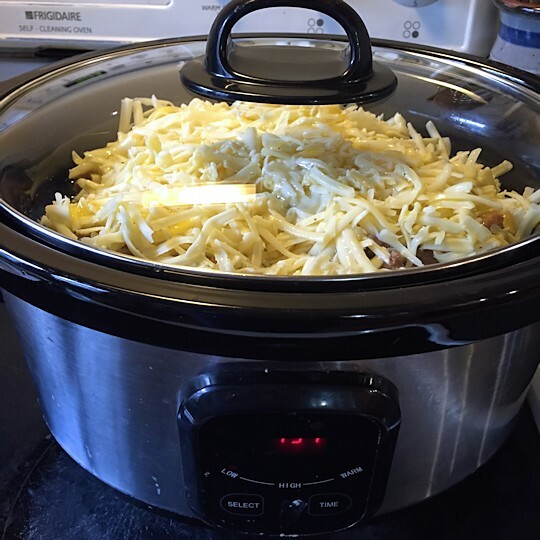 Dump about half the frozen hash browns into the bottom of the crock pot. Layer about half the sausage on top of the hash browns, then cover with about half the cheese. Repeat the hash brown, sausage, cheese layers. Whisk eggs, milk, salt and pepper together until well combined. Pour over the top as evenly as possible. 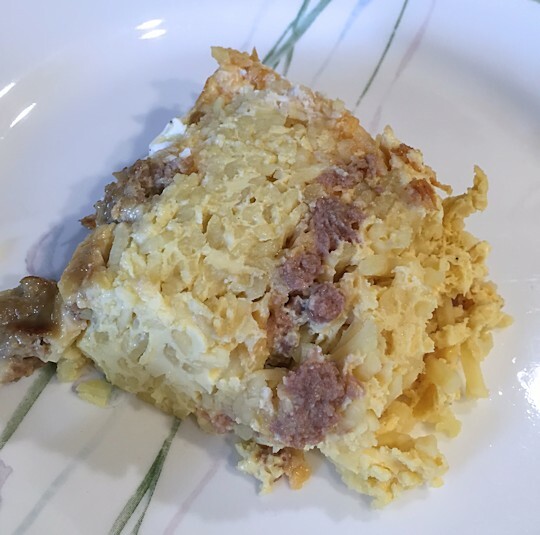 I’m not exaggerating when I say that it’s probably taken me longer to type out the recipe to this point than it took to assemble the breakfast casserole – it really is THAT fast! 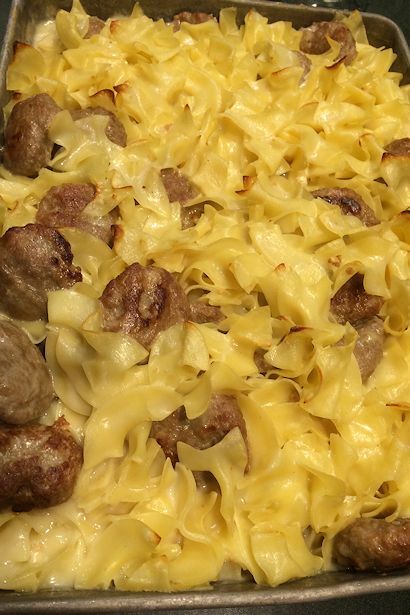 Especially if you save time by shredding the cheese and whisking the eggs while the sausage is browning. Cover and cook on high for 4 hours or low for 8. 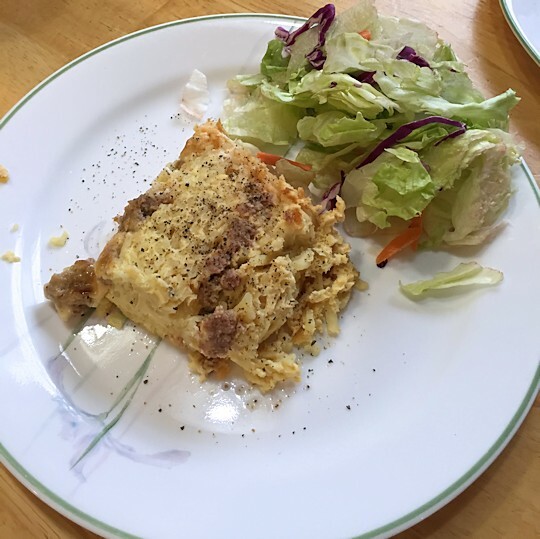 Most of the time we’ve cooked at the higher temperature, but the last time I made the breakfast casserole I used the lower temperature for longer time, and everyone commented on how distinct the layers were. It may not have anything to do with cook temperature and time, but that’s the only thing I can think of that I did differently from previous times. 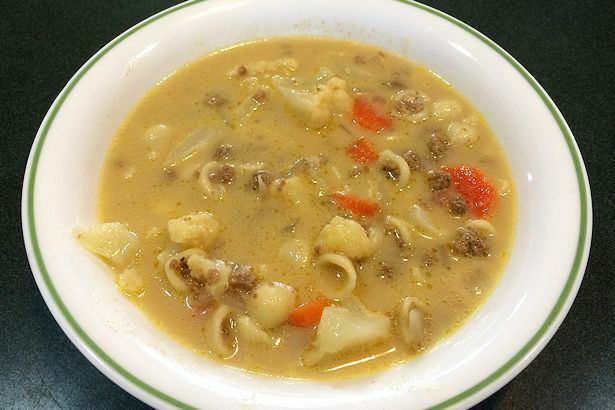 We interrupt this Easy Crock Pot Breakfast Casserole Recipe for a Kippy Break. 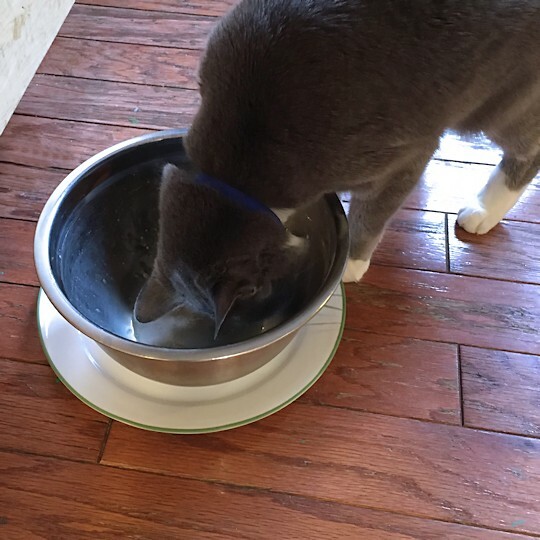 Kippy loves cheese and eggs so whenever we use either in a recipe he gets to lick out the dishes. His mouse catching skills have earned him special privileges for life. 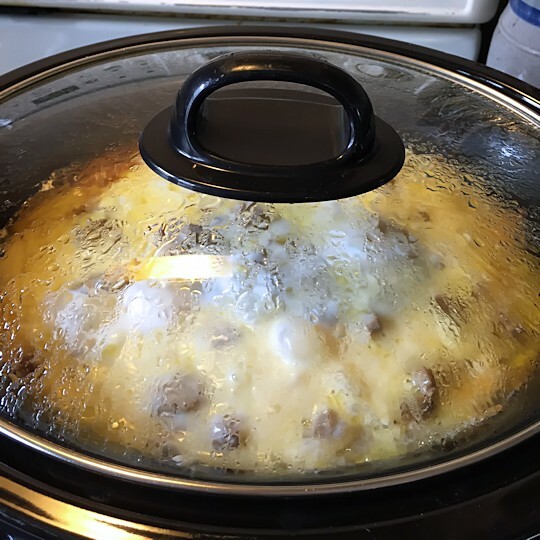 The worst part of making breakfast casserole in the crock pot – or anything in the crock pot for that matter – is that it smells soooo good it drives me crazy all afternoon. Hurry up and get done so I can eat you! Finally, it’s done – time to eat! Look at those layers – obviously I used less hash browns in the first layer than the second, but it still tastes amazing. Add a little more pepper and a side salad, and you’ve got supper. Now hurry up and eat – we’ve got to go! Brown breakfast sausage; drain and set aside. Shred cheese. 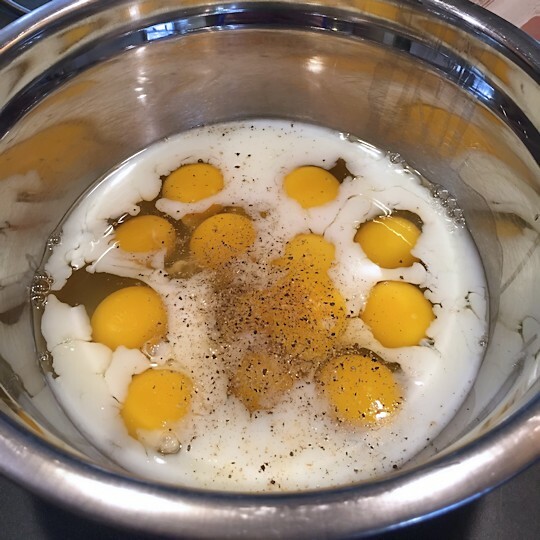 Whisk eggs together with milk, salt, and pepper. Layer 1/2 of the hash browns in the bottom of a large crock pot. Cover with 1/2 the browned and drained breakfast sausage and 1/2 of the shredded cheese. Repeat layers. 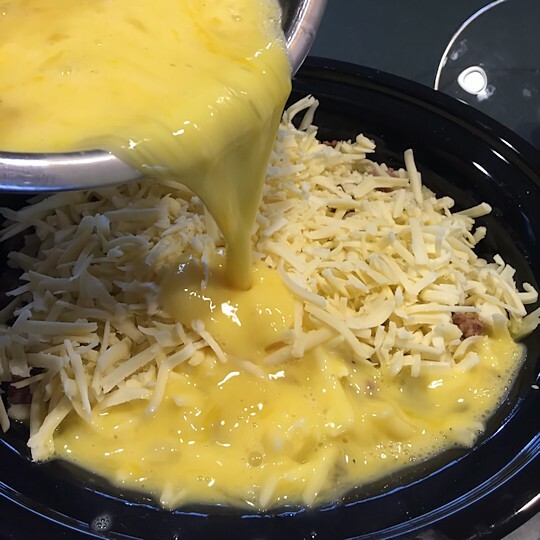 Pour egg mixture evenly over layered hash browns, sausage and cheese. Cover and cook on High for 4 hours or on Low for 8 hours. Iowa Girl includes a layer of sliced green onions in her breakfast casserole recipe, but since our kids won’t eat green onions we omit them. She recommends serving it with additional green onions, salsa, and guacamole. My mom loves eggs with a Mexican flare; I’ll bet she’d love Iowa Girl’s suggestions. For brunch we like to serve the breakfast casserole with fresh fruit and cinnamon rolls or muffins. For supper we serve it with salad or another veggie. 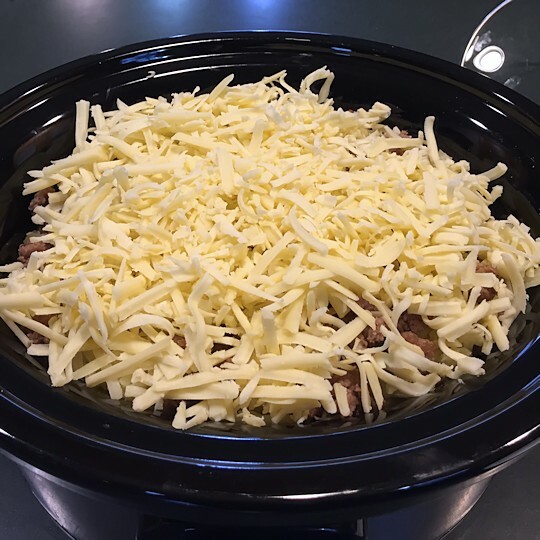 Nutrition: According to MyFitnessPal, the Crock Pot Breakfast Casserole Recipe as listed above contains 340 calories per serving. That’s 42 fewer calories than the original recipe, again according to MyFitnessPal. So far we’ve just made the basic recipe because we know everyone will like it but there’s tons of ways you can change the recipe to make it a little different or to suit your own family’s taste. I think pretty much anything you put into an omelet would be good in this breakfast casserole. What would YOU put into a breakfast casserole?